You'll love this incredibly easy recipe! Your guests will think you spent a lot of time decorating your holiday cookies. Bake cookies according to package directions. Cool completely on wire racks. Line baking sheets with wax paper. Place morsels and shortening in medium, microwave-safe bowl. Microwave on MEDIUM-HIGH (70%) power for 1 minute; STIR. Morsels may retain some of their original shape. If necessary, microwave at additional 10- to 15-second intervals, stirring until morsels are melted. Dip half of each cookie into chocolate. Place on prepared baking sheets. 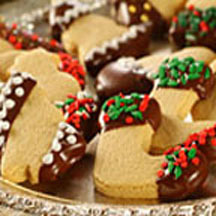 Sprinkle decorations onto dipped half of cookie. Refrigerate for 5 minutes or until set. Decorate cookies with icing packets and more sprinkles, if desired. *May use 1 cup (6 ounces) NESTLÉ TOLL HOUSE Premier White Morsels instead of Semi-Sweet Chocolate Morsels.